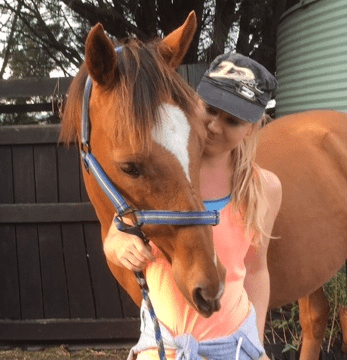 Stringhalt is a common condition afflicting horses in all parts of Australia. I have been treating this condition successfully with herbs and natural feeding for many years. 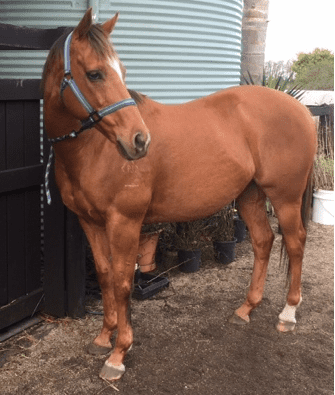 Jade Woodlock from Bayles in Victoria shares her story about her 12 year old Thoroughbred gelding Jaxon. Jaxon came down with Stringhalt in early March 2016 when there was an outbreak in my area. Although I caught it early and removed him from the pasture immediately he progressively got worse. The first signs were when he was backing up, it then progressed to when gently lunged you could see signs of it when he transitioned from trot to walk. I noticed a change in his personality, he seemed more on edge and worried about the slightest thing and that would send his legs right off. He would be a lunatic in the paddock and shying at everything. The neurological signs were most obvious when leading him up to poles on the ground, his back legs would start going crazy about 2 meters before the poles in his anticipation of going over them and it was hard for him to gather himself back together. I also noticed when picking out his feet, he sometimes couldn’t think which leg I wanted and would always pick up two legs… I would have to drop the foot I was working on so he could stabilize himself. Trimming his feet was also quiet an effort. I tried a series of treatments – I increased his magnesium, used “Mag-E” and dolomite, I tried a toxin binder, increased his omega 3 oils, used acupuncture, I bought him massage pads, I tried rest versus gentle work. I had a hair test done and followed a diet based on this – all to no avail. He seemed to be at a constant level by May and I thought surely he would start to improve, but from July to September he was actually getting worse. I was at my wits end. All I wanted was Jaxon to be better. Until one night researching I came across Victoria’s blog about a horse she had treated for stringhalt. I thought what have I got to lose! I contacted her then and there and we got a plan together and started treatment straight away. I kept a video diary of Jaxon during treatment which I sent to Victoria and the difference between the first one on 27th November and the next one a month after treatment started, is remarkable. I was so excited but Victoria said not to expect a full recovery for at least 3 months. So after 4 months of Victoria’s herb treatment and diet and I have my happy, calm healthy horse back! We can go on long rides again and I am slowly introducing pole work with no issues at all. When riding everything feels normal again and he is backing up very well. Natural healing does not provide a quick fix. But it usually provides a steady improvement over a period of time, as the herbs support and stimulate the body in its own remarkable healing powers. In treating stringhalt I employ herbs to provide symptomatic relief while also treating causes. Anti-spasmodic herbs are used to reduce the anxiety and tension experienced by these horses, a hepatic herb always goes in to remove liver toxicity, a herb to remove endo-toxins from the gut and several herbs to strengthen the nerve signals and the nerve pathways themselves, which are badly affected in stringhalt. It is very important to note that I only use liquid medicinal quality herbal extracts in my prescriptions as they are of guaranteed provenance and potency, allowing for relatively low doses from 5 – 10 ml per day. Flower Essences are also added to the mixture, which is syringed over the horse’s tongue, where they are metabolised rapidly because of the quick absorption. This is not the case with dried herbs in the feed, which have to go through the whole digestive process. So dried herbs do not provide therapeutic solutions. He will still be getting dried herbs in his feed as part of his VF Natural Diet to provide essential nutrients, not just calories. I thank Jade for sharing her story and for being such a wonderful carer and communicator, which just makes everything so much easier!